Never let stress shape your strategy. Most women think better after a brisk walk, a light meal, a massage and a nap. Even the most powerful woman needs a place to unwind. I am a huge admirer of Elizabeth I, and this intriguing biography gives a wonderful picture of the era. 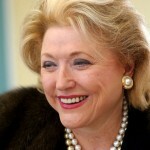 Barbara Taylor Bradford OBE is a best-selling English novelist. Her debut novel, A Woman of Substance, was published in 1979 and has sold over 32 million copies worldwide. To date, she has written 27 novels all bestsellers on both sides of the Atlantic. Her 27th, Letter From A Stranger was released in the UK in September, 2011. It will be published in North America in April, 2012. Bradford is a member of the James Madison Council of the Library of Congress. She is heavily involved in a variety of charity projects around the world including Literacy Partners, the Police Athletic League of New York City PACT Parents and Abducted Children Together US and UK Chapters and The New York Pops Orchestra.